Indians pitcher Josh Tomlin remained unbeaten in 2016 (5-0), and became the first pitcher since 2011 to win his first five outings for Cleveland. Kansas City, which received another supporting performance from first-baseman Eric Hosmer with a home run, has gone just 3-9 in its last 12 games and continues to trend in the wrong direction. Volquez, who has been Kansas City’s most reliable starter, gave up homers to Mike Napoli and Carlos Santana in the loss to drop his record to 3-3 on the year. 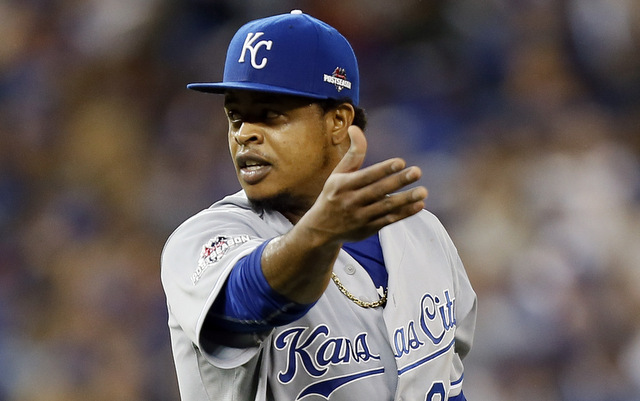 With a 3-2 lead, Volquez complained to umpires that he didn’t like the setup of the mound. After a delay and some maintenance, the game resumed, and KC’s ace subsequently gave up three runs to make it 5-3. It was yet another performance in which one of the either pitching or batting didn’t do its job. This time, KC opened up an early lead with the Hosmer home run, but Volquez wasn’t able to hold the Indians at bay. In just as many losses this season, it goes the other way–pitching failing the hitting. All-in-all, the Royals just aren’t in sync and have yet to hit their stride. With the Chicago White Sox player so well, the Royals cannot afford to let their inconsistency’s hold them back for much longer, as it related to the American League Central race. Kansas City now travels to New York to take on the Yankees. First up for the Royals in the rotation is 1-4 Chris Young, who is desperate for a win. The 4-game set is the last of the road trip before KC heads back to Kauffman Stadium for series against Atlanta and Boston, and will conclude a stretch of 13-straight days without a break. For tickets to the next homestand, visit Tickets For Less and choose from a variety of seating and parking pass options. With zero hidden service fees, what you see is what you get on all ticket purchases. Whether it’s the next set of home games, or future games down the road, Tickets For Less is your source for Royals tickets. Don’t miss out on your chance to see the boys in blue take the field at Kauffman Stadium!